I'm a freelance beer writer and beer judge. I've previously worked as Communications Manager for distributor and retailer The Bottle Shop; and in Sales, Media and Events for craft brewery Brew By Numbers. I'm a UK contributor to Good Beer Hunting, and co-authored Future Publishing's 'Craft Beer: 365 Best Beers in The World' and 'Craft Beer: 100 Best Breweries in The World'. When the brilliant Brewhouse & Kitchen Islington opened near Angel station last year, I was embarrassed to learn that there were already successful branches of the brewpub group in Dorchester, Poole and Portsmouth, of which I was completely unaware. 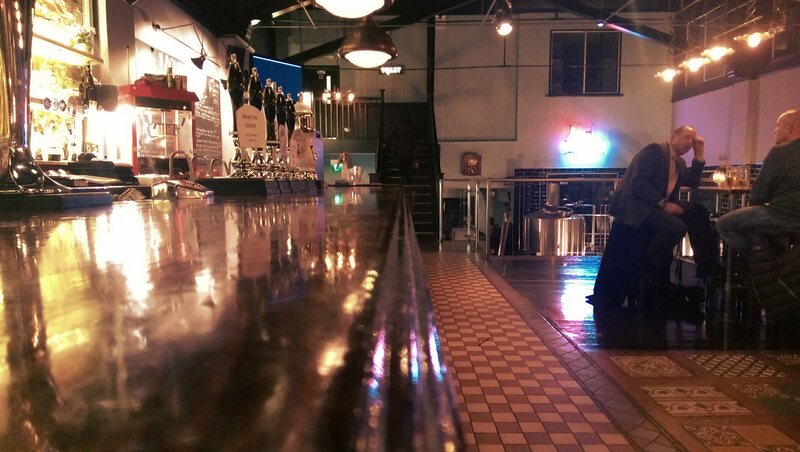 My blinkered capital-view had hidden these excellent brewpubs from me, and it gave me a dose of what I call London Guilt. My partner’s family lives in Bristol, so when the latest branch opened there last month, I was determined to check it out on our next visit. I couldn’t make the launch event sadly, a disappointment all the more crushing for the fact that the man who was the body of Darth Vader (Bristolian bodybuilder David Prowse) was there at the party. Like the other Brewhouse & Kitchen brewpubs, the brewers here take their cues for beers from the city the pub is in. Naturally, a Sith-influenced Papa Darth oatmeal stout is available (‘on the dark side’ jokes abound), alongside Yankee Cabot (named after the Italian explorer who was a citizen of Bristol and after which many landmarks are named), Deception Rye IPA (named for Derren Brown who studied in Bristol and first performed there) and others. All their own beers are brewed onsite in the very visible and pretty brewkit, and as seen in the picture above a decent array of keg and bottled beers are also available. The beer that really impressed me both on my first and subsequent visits was the 3.9% Hornigold Blonde Ale, the vibrant pint pictured above. Hornigold was the mentor of Bristol’s more famous pirate son: Blackbeard, and the brewers clearly thought his name would look nice on a golden ale. I’d arrived at the bar early afternoon and fancied something fairly light and easy-going, but was blown away by the peach-and-melon sweetness running through Hornigold, sharpened by a juicy grapefruit finish. It was remarkably similar to a great pint of cask Oakham Citra, but maybe 18 months or more ago when Citra was in its best form. Hornigold was a pint upon which I lavished the highest compliment: the same again, please. Dead or Alive: Are single-hopped beers still interesting? One of the textbook rites of passage for the modern, budding beer geek is to buy ‘single-hopped’ beers to find out the flavour and aroma characteristics of specific hop varieties. With each flavour, some increased knowledge or understanding of it is (hopefully) stored subconsciously, and the next time we experience it, it becomes a little easier for the firing synapses to locate the relevant file of previous experience. A brewery that has truly committed to the single-hopped idea is BrewDog, which recently released its fifth annual IPA is Dead series. The hops selected are chosen based on a combination of public interest (including suggestions from social media) and, mostly, I suspect, brewer curiosity. With new BrewDog bars opening on an almost monthly basis, it’s getting easier each year to pop along to your nearest one on day of release and order a flight of the latest series to try them out. For some, the appeal is simply to taste something they haven’t had before. For homebrewers and committed beer geeks, single-hopped beers represent an opportunity for personal development and gaining valuable experience. The thing is, most hops, like most people, are normally only very good at one or two things, and not many people can even claim to be that talented. Single-hopped beers require the hop variety in question to be used at multiple points in the process, instead of just where they would normally perform best. Sometimes the ‘truth’ of a hop’s character is blunted or stymied by it being used at every stage in the brewing process. Others, meanwhile, revel in the challenge and reveal incredible depths, clarity or raw flavoursome power. The latest BrewDog IPA is Dead series sees another eclectic mix of craft beer favourites and up-and-coming new varieties: Mandarina Bavaria (a great potential Bond heroine name), classic US bitter monster Chinook, juicy Oz-German hybrid Ella and modern British hop Pioneer. Mandarina Bavaria certainly delivers a lot of sweet orange and pithy peel in its aroma. There’s also something stickier and alcoholic like peach schnapps, perhaps revealing the hop’s difficulty in overcoming the beer’s 7.2% abv. I found the Mandarina Bavaria very sweet, but with a tangy lemon sherbet flavour rather than full-on mandarin. The bitterness is sudden and schizophrenic – twisting juicy fruit into a raspingly dry finish reminiscent of Jever. The strength of the beer was much less evident in the flavour, in fact I gulped it down like it was a juicy and bitter pale ale, so here the hop really shined. Pioneer, a British hop, can have bright lemony flavours and woody, cedary notes when used well. In a 7.2% IPA, the flavours seem to come down quite hard on woodiness, almost piney in the finish, whilst the aroma was somewhere between warm lemon curd and marmalade. It didn’t quite gel with the strength and malt profile of the beer, but certainly taught me in explicit terms what Pioneer tastes like. Ella, meanwhile, is an Australian variety related to the super-peachy aroma hop Galaxy and the German bittering hop Spalt. Brewers like its flavour-efficiency, as it can be used in moderate amounts to replicate full-bodied continental lagers, or in larger amounts to deliver massive tropical juiciness. As it’s the only hop in the beer, Ella turned the IPA into a dangerously quaffable blend of sharp bitter grapefruit, tart lime and caramelised peaches. The finish is actually my favourite part, leaving just enough of each flavour to make the mouth water for more. Finally, Chinook delivered a somewhat predictable hammer-blow. A hop that can be used for bittering or aroma, Chinook is a notably piney and spicy US hop that tends to dominate the finish of any beer it’s used in. It’s a favourite of BrewDog’s so I had a fairly good idea of how it would taste, and I was glad I elected to drink this one last. The bitterness and pronounced pine and woodiness was palate-shifting. This is the funny thing, though: whilst each of the beers seemed to have markedly different levels of bitterness and hop flavour, all of them were brewed to have 75 IBUs. As any brewer will tell you, that number on the brewsheet is not the same as perceived bitterness in the final beer – the reason why a 45 IBU pale ale can taste less bitter than a 45 IBU pilsner. Brewing each of these beers to 75 IBU isn’t necessarily the best showcase of each hop, and often, individual hops, like people, perform best when partnered with others that have different strengths. Since this was the first time I’ve had all four of the series in bottles at home, so I couldn’t resist flipping the concept on its head. In previous releases, the hops used for IPA is Dead were often so diametrically opposed that it would never occur to many people to try blending them, but this year’s release seemed to have traits that could work in unison. After opening each bottle I poured roughly 100ml into a growler that I kept in the fridge, and after tasting all four I had an equal-parts blend of each beer. The result was surprising, in that each of the component beers could be tasted and seemed to interact with each other – the resinous spike of Chinook evened out the peachy syrup of Ella, the lemon and orange in Mandarina Bavaria softened the bitter, woody tang of Pioneer – but whilst it broadly worked, it was not in any sense a complete beer. Each beer had used its hop at all addition stages, for bitterness, flavour, aroma and dry hop, so the positives aspects were spread thinly across the palate. What would be more interesting, would be if the IPA is Dead series starred a fifth beer, where the brewers used the hops from the four single-hopped beers in different proportions at different stages to best suit their characteristics. Just as important as learning what hops taste like when working alone, is learning how they can work together. The lessons learned from the flavours of the single hopped versions could be galvanised in the the fifth, when you see how and when they should be used to best effect together. What do you think? Thanks to BrewDog for sending me this year’s IPA is Dead series. Author Chris HallPosted on April 20, 2015 April 19, 2015 Categories ReviewsTags brewdog, Chinook, Ella, IPA is Dead 2015, Mandarina Bavaria, Pioneer10 Comments on Dead or Alive: Are single-hopped beers still interesting? It’s Wings Wednesday that typically brings me to North Finchley’s The Bohemia pub, the recently refurbished flagship pub from the owners of The Bull in Highgate. The offer of 500g of spicy Buffalo wings (some of the best this side of the Atlantic I’ve been assured) for five pounds is hard to resist. As North London goes, The Bohemia is very north, but more than worth the extra minutes by bus (134, 263, N20, 460, 82) or tube (North Finchley, Woodside Park) when you get there. The place is wide and deep, lavishly furnished and skilfully halfway between modern and traditional, in proportions more in common with a spacious, town centre pub than anywhere else in London serving La Chouffe and Veltins on tap. Of course, the key difference here is the Bohemia is home to a brewery as well as a well-stocked bar – the London Brewing Co, which also brews at The Bull. Whilst the beers brewed at The Bull are packaged in casks, The Bohemia’s kit generally brews beer for keg. The brewers have already turned out a wheat beer, stout, rye IPA and session IPA, which are naturally all available at the bar just a few metres away. Currently the most impressive of these are the ‘Stout’, displaying a creamy coffee yet dry, herbal hoppy character I’d most recently enjoyed in O’Hara’s Stout in Dublin, and the ‘Upright’ session IPA, which tasted every bit as good as fresh Founders’ All-Day – orangey, oily, boisterously bitter – but fresher. Brewer Daniel Vane has recently returned to London Brewing Co with plenty of ideas in mind, as recent shots of a brewday for a lychee pale have shown. He’s assured me there’s plenty more in the pipeline, some of which will be available at the forthcoming Northern Line Beer Festival on 22-26 April, which will feature beers from a number of celebrated Northern-Line-based brewers (including the new, Derek Prentice-helmed, Wimbledon Brewery) and will also include beer and book matching from Pete Brown and a beer-paired dinner at The Bull. What I love most about The Bohemia, even more than the wings (somehow), is that there’s damned good beer there, made just a few steps from the bar. That distance travelled to the pub itself is compressed, folded and shrunk somehow by the difference made by that short distance between the brewhouse and the bar. There’s nothing quite like taking a gulp of daisy-fresh session IPA and being able to see where it was lovingly brought to life. A new photo-blog series, taking in the most interesting bars and pubs in London and beyond. Alan Yau (founder of the Wagamama chain and owner of several Michelin Star-awarded restaurants) is one the last people you might expect to get in the pub game. In what is seen as a dramatic departure, the OBE and restaurateur has given equal focus to beer as well as food at his latest venture – a ‘Chinese-influenced gastropub’ in Soho. The area has been worn down by its reputation into a bit of a parody of itself, but in doing so provides a number of unusual and striking venues, of which The Duck & Rice is undoubtedly one. I couldn’t quite place the theme of the decor, but I heard somebody say ‘Park Chinois’. There’s a very Hong-Kong-in-the-Empire kind of aesthetic: lavish colonial decor, striking marble, blues and pearl colours, art deco painted glass, reminiscent of a bar at the edge of the world and full of its riches. It seems decadent, but fairly relaxed. The reason I was here of course, was the beer. Pilsner were sponsoring the press launch night, so their beer was flowing freely, but the bar also has an impressive variety of other cask, keg and a (rapidly growing) list of bottled beers from the leading lights of the beer industry. Still, the star on the bar was Tankovna Pilsner Urquell, freshly delivered from Pilsen. The stacked, copper 500 litre tanks greet you like a steampunk bouncer as you enter, and beer was on top-notch form: the almost cask-ale-like mouthfeel, nourishing breadiness and spiky bitterness all present and correct. Whilst upstairs is more restaurant-like, the focus here down in the bar area is just that, the bar, and food is focused on simple Chinese dishes and snacks to match with the beers. Light, crispy batter-coated delights melted sweetly with gulps of Pilsner, like they had known each other for ages. Suddenly, elegant Chinese food and pints of Czech Pilsner felt like the most normal thing in the world, as well as something quite special. The Duck & Rice, 90 Berwick Street, London W1F 0QB. As the world of craft beer becomes ever more litigious, I get advice from legal experts on the risks facing UK brewers with regard to trademark and copyright law when exporting to the US. Beer is a form of cultural currency. I first heard this concept from the lips of Garrett Oliver in his keynote speech at the European Beer Bloggers Conference in 2013, and it really affected me. Looking at the world’s best beverage through the eye of a cooly distant observing scientist reveals that it tends to go where civilisations go, and according to some, may have been crucial in encouraging the nomadic wanders of early humankind to settle and found civilisations in the first place. As beer styles and the ideas behind them have travelled across the globe, first by word-of-mouth (or chiselled Sumerian tablet), then by road, ship, rail, sky and now instantaneous communication, we live in a world of beer that is incredibly connected. That inter-connectivity has brought with it some fantastic collaborations, but occasionally results in the equivalent of bumping into someone who is wearing the same clothes as you. Legal disputes have become the unpleasant aftertaste to the diverse flavours of craft beer’s meteoric rise, and those over intellectual property (IP) and trademark law are some of the bitterest. Whilst we all know of the more high-profile cases, it’s become a concern to me recently that the fastest-growing of the smaller brewers take their first steps into the export market could find themselves suddenly and catastrophically in costly legal trouble. Some have cottoned on to this risk, others have found out the hard way. As an example, Wild Beer Co’s Ninkasi had to be sold under a different name in the States to ensure Ninkasi Brewing wouldn’t take issue. Of course, I’m not the only one thinking about this. Brendan Palfreyman is an attorney with Harris Beach PLLC in New York, and a major focus of his practice is representing and counselling breweries in the US and abroad on legal issues in the US, including trademark and copyright. Brendan (who you can follow on Twitter, and I recommend you do) is also an award-winning homebrewer and an Allied Member of the New York State Brewers Association. I asked him a few questions about the legal risks faced by UK brewers exporting their beer to the US. What are the most crucial legal concerns that UK brewers should be aware of regarding trademark and copyright law before exporting their beers to the US? “The critical body of intellectual property to be concerned about in this regard is trademark, not copyright. Copyright can play a role, but it’s typically not a major one in beer-related IP disputes. Copyright could come up, for example, with regard to label art/design. Trademark, on the other hand, pertains to brewery names, beer names, logos, and the like. The most important concern is that a UK trademark will not protect a UK brewer in the US. Another issue is the potential infringement of pre-existing federally registered trademarks – the test in the US is called likelihood of confusion and it is a multi-faceted analysis. Additionally, a pre-existing federal trademark can be used to prevent the importation of goods, including beer, at the border by US Customs and Border Patrol. This can be devastating for obvious reasons to a UK brewer seeking to export to the US. What can UK brewers do to prevent or remedy these potential problems? “The two most important things that can be done are proper trademark searching and federal trademark registration. Trademark searches can informally be run on Google and beer rating sites like BeerAdvocate and RateBeer. The most important trademark search is done on TESS, or the Trademark Electronic Search System, which is the federal government site. The searches can be somewhat complicated because it’s not just exact matches that can cause problem. For example, a search for Red Road should also cover Red Street, Road Red, Rad Road, Scarlet Road, etc. Generally, trademark filings in the US are the best protection a UK brewer can have. The brewery name is essential, and likely each of the beers that will be imported in any quantity as well. If a UK brewer already has a UK registered mark, he or she may be able to use that as the basis for a US trademark. A UK brewer may also wish to take advantage of the Madrid Protocol, of which both the UK and the US are parties. This allows parties to file a single international application based on at least one preexisting registration, and then to use that to file individual applications in different countries. Are you aware of any examples where a UK brewer has done exactly the right thing? Do you expect to see a lot of high-profile legal action in this area in future? “Absolutely, there are over 3,800 breweries in the US at present and the numbers are growing every day. This does not take into account the hundreds of breweries importing into the US. As these numbers continue to grow, trademark disputes are likely to grow as well. Just recently there was a major and brief lawsuit between big craft beer players Sierra Nevada and Lagunitas. There was also lawsuit filed in New York recently by Canadian brewer Moosehead against a small NY brewer that makes a root beer called Moose Wizz. In an industry where over a thousand breweries are regularly launching new beers, without always taking advice, there will always be accidental conflicts over names. However, such issues can be resolved in a reasonably civilised manner and without adverse publicity, for example when Thornbridge Brewery agreed to alter the name of their black IPA “Raven” to “Wild Raven” following a request from The Orkney Brewery, which brews a bitter called “Raven Ale”. The future? Designs for Cantillon’s new packaging. It’s still sinking in, to be honest with you. The first time I visited Cantillon nearly two years ago, it was breathtaking. It was everything people said it would be, and more, because there is a level of sensory interaction with the place beyond smell, sight and sound that is hard to put into words. And that’s before you taste the beers themselves. All of them, including the fresh and utterly mystifying lambic, were incredible. Incredible because they provided new flavour experiences but also left questions. What is that flavour? What does this remind me of? Is this still even beer? Like the best pieces of art, so much of what is great about Cantillon is unspoken; undeclared; nuanced and yet, vibrant. Jean Van Roy presides over one of the most highly-regarded breweries in the world. Why then, would Cantillon need to do anything differently? Why would Van Roy, one of the world’s most respected brewers and an undeniable master of his craft, need to change processes there? “America” must surely be the simple answer. Bottles of Cantillon’s beers do not travel very far, and with a massive (and growing) population of drinkers interested in craft beer and unique, sour styles, the homegrown varieties are no longer enough. The lucrative export market, denied to Cantillon for so many years, is now finally within reach. When I received the email yesterday from a slightly nervous man from the “Ni-san” PR agency, wondering if I could look at some proofs of designs sent to him by his client, a ‘very known Belgium brewery’, I had concerns. He seemed reluctant to show me any images without me agreeing to ‘consult’ on them. I said fine, I’ll help however I can, and the next email I received astonished me. Cans. From Cantillon. The man had found my blog posts about craft beer in cans and thought I was a good sounding board for what would prove to be the early designs for Cantillon’s new canned beers. I couldn’t believe my eyes. Immediately my mind ran away with itself, picturing slabs of Fou’foune in my fridge, but no offer of samples was forthcoming. Indeed, the entire thing was over as suddenly as it began. A subsequent email just twenty minutes later begged me to delete the previous one with the images attached, said there was no longer ‘obligation for services’ and that I should act as though the entire thing had never happened. I suppose we’ll find out at 12pm. Author Chris HallPosted on April 1, 2015 May 10, 2016 Categories Breweries, FictionTags Cantillon, craft beer in cans4 Comments on APRIL FOOLS’ DAY: Can-tillon? Manchester’s Cloudwater Brew Co has launched this month to a mix of high acclaim and wary suspicion. As much of the UK beer scene, and Manchester in particular, welcomes the brewery’s plans and ambitions with open arms and eager tastebuds, a section of the beer-drinking and industry-critical public has already made its mind up. To them, Cloudwater are a slick, self-consciously ‘craft’ brewery riding a wave of hype and getting a mob of blindly-enthusiastic, instantly loyal fans raving about their beers before they have even been put on sale. This very blog post will be treated by the same people as witless flag-waving by yet another sucker. But there’s more to this new brewery than (admittedly very, very pretty) branding and big talk. The credentials of those involved, formerly of Marble, Summer Wine, BrewDog, Port Street Beer House, and others, isn’t under any doubt. Early tastings of the first batches brewed on Cloudwater’s kit are almost universally favourable. So what’s so controversial? The brewery’s output and designs for the future are unquestionably at odds with traditional brewing industry. That doesn’t mean an eclectic core range of obscure styles, but in fact, no core range at all. Four separate, distinct ranges will release across each year, using the best available ingredients to make the most flavoursome beers that can be made with what’s available. In an industry increasingly filled with tropes and cliches, many see Cloudwater’s approach as thrilling, while others see yet one more gimmick. The self-stated focus on “modern, seasonal beer”, deliberately side-stepping the C word entirely, is a simple, pure and impressive attitude. Why say you’re craft, when you just are?. What’s really got people talking though, is the size of the venture. The almost industry-standard approach for a financially solvent and confident new brewery is to start out with a 5 BBL (~800 litres) brewhouse. This is seen as a sizeable, serious but cautious investment. Cloudwater are starting with a brewhouse three times that size, and that’s just the beginning. In Britain, we can’t help but be suspicious and critical of those with deep pockets and high ideas of themselves. I’ve assured myself of the quality of the beer Cloudwater has made so far (the Pale Ale and Table Beer in particular, on cask at the Wenlock Arms at the weekend, were both beguilingly clever and accomplished). What I really wanted to know was the motivation behind Cloudwater, and how they see themselves and the people who are critical of them. Paul Jones, the brewery’s co-founder, was more than happy to oblige. All the people involved in Cloudwater are heartfelt beer lovers and more importantly, genuine and clear-headed people, but Jones is undoubtedly the brewery’s voice, one that is utterly without doubt and unambiguous about what Cloudwater is. Why have you started Cloudwater at this size, when many people would see it as safer and less costly to start small first? “Whilst it’s true to say that a smaller brewery would have probably cost less, only a third of the cost of our set up has been spent on the brewery itself. The rest of our budget was taken up with infrastructure such as flooring, utility supplies, and the equipment and space necessary to package and store our beer well. “In his previous brewery, James Campbell comfortably brewed on a similarly sized brewery, and built up the brewery to regional, if not national acclaim. If we would have been starting a new brewery, without a head brewer of 20 years experience, it may have been fitting to start small to see how it goes, but James’ track record is strong, and gave us the confidence (some would say cheek!) to be aspirational. “I’d like to add that we’re not so fresh faced and youthful as we once were. Food and drink industry employees (along with employees in far too many other industries in the UK) are too often woefully underpaid, and consequently result in businesses staffed in the majority by those young enough to not have yet developed significant financial worries or commitments. If we are to be a business responsible for the long-term wellbeing of our founders and staff, we have to take rather less craft-star things like pensions, living wages, retirement plans into account as early as possible. We’re actually trying to run a business as well as a brewery. How long did it take you to decide on the size of the brewery you would be building and using? “We asked many of our friends in the industry for their advice with regards to brew length. The majority suggested we start even bigger (20 and even 30 BBL). If you look at the successes of nearly every brewery that is making great beer right now, you’ll notice many breweries doubling in size in rather short cycles. The resounding opinion was to go for a brewery as big as we could afford. Did the beers you want to make determine the brewhouse, space and other factors of the planning, or did the recipe designing come afterward? “Very early on in planning the brewery we talked about how to ensure we had a modern, technically-proficient brewhouse that would allow us to competently make ales and lagers. This very much informed what we looked for, the manufacturers we ruled out early on, and those who we attracted quotes from. “Planning a brewery means thinking from as many perspectives as possible about space requirements – How much space is needed for raw ingredients, and packaging equipment and packaged goods? What happens if or when we need to install more fermentors or conditioning tanks? “We poured over our floor plans as many times as we could, but we had just a rough idea of the space we were looking for. In the end, what it really came down to was the types of warehouses and larger archways that were available, and what we thought we needed to do to transform them into the sort of hygienic food production facility a modern brewery is. A project the size of Cloudwater’s is outside of the financial reach of many breweries when starting up. What would you say to people who think you are ‘buying’ your way to the top of the craft beer scene? “The first thing I’d say is that life’s a little more fun with a touch less cynicism! There are no shortcuts. The craft beer scene, with the exception of a little hype here and there, functions as a meritocracy. The vast-sized family brewers and global industrial brewers are suffering market share losses despite turnovers that eclipse the craft beer scene in the UK, evidencing the fact that money won’t solve so many problems. Since you’re starting at a point which many brewers would dream to be in in 5-10 years, does this allow you to dream even bigger for the future, or are you more worried about properly executing everything you plan for the present? “We’re starting at a point that I believe our head brewer has thoroughly earned and deserves. Before there was a craft beer scene in the UK, even before I really liked beer myself, James was working hard to push the beer scene forwards, and acting as an early (some would say pioneering) champion of NZ hops, and hoppy beer in general. Whilst some brewers may dream of this point in 5-10 years, James has been dreaming of it for nearly 20 years. “We have a list of ambitions as long as all our arms put together, but we won’t achieve a single one without careful attention to the here and now. A bright future, whilst envisioned by dreams and idealist vision, is the result of current efforts (and a little good fortune and happenstance). We’re starting a new brewery in an incredibly well-developed scene, and would be foolish to do anything other than recognise that quality is ever more important than newness or variation.